Tinted moisturizer? What is a tinted moisturizer? So why do we need a tinted moisturizer? Think of it as the perfect combination between your daily moisturizer and a light foundation. Tinted moisturizers share a similar category to BB creams and CC creams but differ slightly. A BB cream is used to prime, moisturize and provide light cover for your skin. Then we have a CC cream which does what a BB cream does but often with added benefits such as anti-aging, acne healing or correcting uneven skin tone. A tinted moisturizer is perfect for you if you like to keep your cover light and fresh looking. The main purpose of a tinted moisturizer is to offer hydration to the skin while providing light cover to correct skin tone and cover up unwanted marks. This is definitely a product for anyone wanting a fresh natural look when leaving the house, or perfect if you’re in a rush and need to combine moisturizing and foundation into one quick and easy step. Many tinted moisturizers are great too because they don’t have that heavy feel like foundation, and in turn, it keeps your pores unclogged. The tint comes from hyaluronic acid which tints the skin while providing elasticity and does not clog the pores. Even though it says acid it is not a harmful ingredient and won’t get you dark spots like the cheaper alternatives sometimes do. A tinted moisturizer is best to use during summer months and hot days, as it is light wearing and will keep your skin well hydrated when you need it most. Tinted moisturizers are formulated as almost a gel cream which keeps them light wearing and refreshing compared to a heavier foundation. Now that you’re sold on the product which is the best one to go for? We have a list to help you decide. Check out below our pick of the best-tinted moisturizers for your skin type. A combination of make-up artists, beauty experts and top models from around the world were interviewed to get a list of the best tinted moisturizers available on the market today. With this review & buying guide you should be able to find the best products for your skin. Balm Shelter is a tinted moisturizer which aims at providing great sun protection for everyday use. This tinted moisturizer contains sun protection of SPF 18 which is the perfect amount to apply daily. If you are going to be in unavoidable direct sunlight be sure to add additional protection of at least SPF 30 over this tinted moisturizer. This is perfect as a workday tinted moisturizer or even for summer beach days. Thinking about taking a dip in the pool, don’t forget to apply water-resistant sun protection over this tinted moisturizer, you can never be too careful with the sun. Balm Shelter comes in a funky tube and offers broad-spectrum sun protection, with a weightless feel on the skin. Not only does it work as a protector, but it tints to correct the tone and texture of the skin too. The Balm is a brilliant quick fix make-up brand, wanting to supply us with the best quick solutions for our makeup collection. We think they’ve done a great job with this product. Moisture, protect and correct all in one, and their products are paraben and cruelty-free. Their range includes 7 colors which do tend to stay on the lighter side (especially for a darker skin tint) but remember it is a tint and not a full foundation. This is a super cute and funky tinted moisturizer which is made to leave your skin feeling silky, smooth with a polished complexion. Isn’t that what we all want? The Jane Iredale Dream Tint Moisturizer is a sophisticated hydrating tinted moisturizer with an amazing range of detoxifying natural ingredients. This tinted moisturizer comes with a broad spectrum SPF 15 protection and is water resistant, making it a great summer holidays option. Jane Iredale brand prides themselves in being skincare makeup, putting the health of your skin first. The Dream Tint Moisturizer provides you with ultra-moisture and hydration while supplying an even glow, smooth texture and it works to retain the natural moisture of your skin. This product is great for sensitive and fair skin, it is also hypoallergenic and non-comedogenic, which means it does not clog up your pores. This product works to prevent sunburn and uses mineral ingredients to smooth and calm skin. It comes in a range of 7 shades, which are oil-free. Some of the stand-out natural ingredients include algae extract, sunflower oil, and pomegranate extract. The algae work to soften and detox the skin while the sunflower and pomegranate act as anti-aging agents which supply the skin with essential omega oils. Jane Iredale offers a full range of mineral makeup products, and they advise this product should be used in conjunction with their Smooth Affair Primer, and Hydration Sprays for an optimal smooth finish. Bobbi Brown is an internationally trusted make-up brand, who pride themselves on the flawless natural look. All their products are dermatologically tested. The Bobbi Brown Extra Tint Moisturizing Balm has a broad spectrum SPF 25 sun protection which protects the skin from those harmful UVA/UVB rays we all try so hard to avoid. The Extra Tint Balm provides a slightly heavier tint than the previous products, it also has more sun protection making a great choice if you are looking for a good cover, hydration, and protection. This particular tinted moisturizer is best for dry skin. It is formulated to blend smoothly and is great to build on with other makeup or skin products. Leaving your skin hydrated with a natural smooth finish. The Extra Tinted Moisturizing Balm works to reduce the appearance of fine lines, while hydrating and protecting skin. It has been said to leave you with a dewy radiant look, for ultimate hydration. 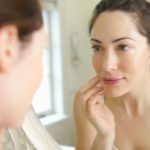 An impressive ingredient in this product is their Argireline peptide, which boosts the production of collagen in the skin, ensuring anti-aging and hydrating results. 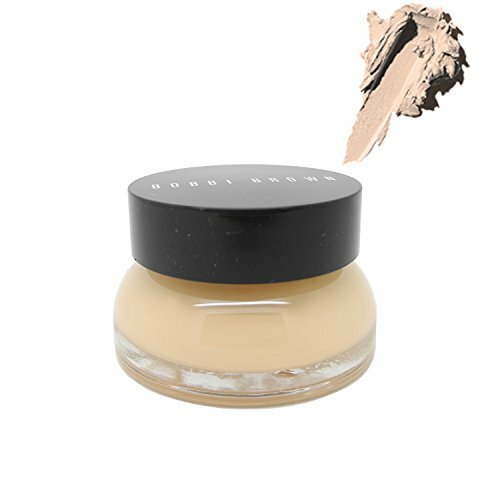 As many of us know Bobbi Brown has a wonderful range of make-up products and this tinted moisturizer is perfect to pair with any of their primers, foundations or blushes. Available worldwide this is definitely worth a try for light cover and dry skin. 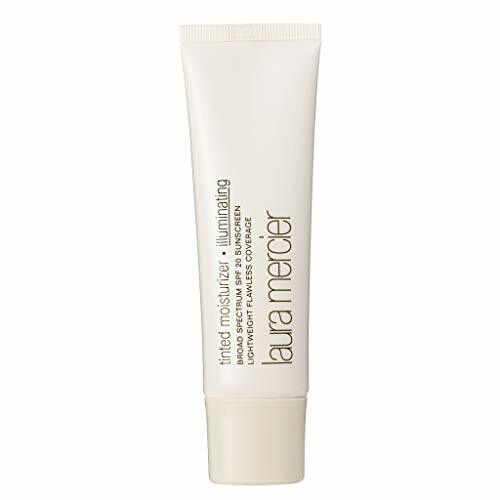 This Illuminating Tinted Moisturizer from Laura Mercier is elegantly packaged, providing protection of SPF 20 and a promise of Natural Radiance. This tinted moisturizer provides lightweight coverage for a natural looking, no makeup finish. With an SPF 20 protection, it will keep your skin free from the effects of harmful UVA/UVB rays. It provides light coverage while evening out skin tone. The moisturizer is non-comedogenic making it light on your skin and healthier for your pores. It comes in 5 different color tints and has a non-greasy feel when applying. This award-winning tinted moisturizer is great if you feel your skin is a bit dull or tired looking, this product is sure to provide the boost your skin needs. It easily blends and can be used in place of your everyday foundation. For excellent results use the Laura Mercier primer before applying the tinted moisturizer. The finish is a stunningly smooth dewy look, leaving you looking natural and refreshed. This is thanks to their micronized pearl pigments containing anti-oxidants to protect your skin from harmful free radicals. It also contains vitamin E oil which is essential for its brilliant anti-aging and hydrating properties. This is the perfect product if you have mature skin which needs a boost. Tarte Cosmetics are a firm favorite when it comes to natural ingredients cosmetics. Especially when shopping their Amazonian Clay range you can expect top quality natural anti-oxidizing ingredients to be packed into their sustainable packaging. The Smooth Operator Amazonian Clay Tinted Moisturizer is no different, with an SPF 20 protection, hypoallergenic and fragrance-free this is the perfect repair and protect tinted moisturizer. The Smooth Operator is also impressively water resistant and rich in vitamins such as vitamin a, c and e. All of which hold anti-aging and skin renewal properties. This tinted moisturizer works to prevent premature aging, so be sure to grab it in your 20’s to prevent those fine lines and wrinkles from creeping up on you at a later stage. This product is safe for all skin types including sensitive skin and its vegan, if you’re looking to save the world one product at a time this is where you should start. The list of natural ingredients is long, but to name a few stand out ones, we have fruit extracts from lemon, orange, and apples which all work to revitalize the skin and protect it from free radical damage. In case you are wondering the Amazonian Clay is from the banks of the Amazon River, it is rich in nutrients responsible for providing the skin with elasticity, clarity and a smooth texture. 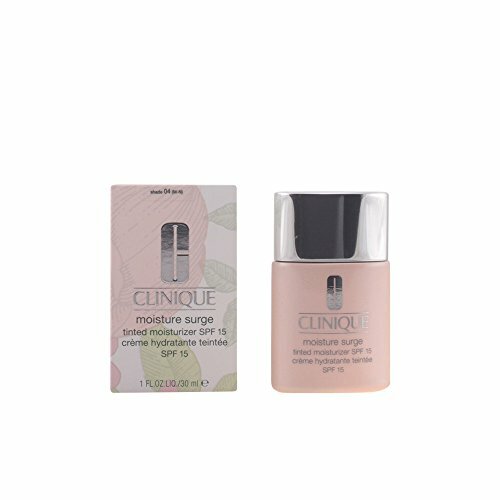 The Clinique Moisture Surge has a huge focus on hydration for your skin. This Tinted Moisturizer is a broad spectrum moisturizer with an SPF 15 protection keeping your skin protected from harmful UVA/UVB rays. As always if you are going to be exposed to an excessive amount of unavoidable sunlight be sure to top up with nothing less than an SPF 30 cream. Clinique is an internationally well-known make-up and beauty brand which offer a large range of trusted products. The Moisture Surge Tinted Moisturizer is no different when it comes to quality. This lightweight, oil-free moisturizer is great for all skin types, giving you a natural finish and even tone. The mineral enriched ingredients ensure your skin is protected, hydrated and covered. The moisture surge supplies the skin with intense hydration while delivering a color perfecting skin tone and complexion. Some of the ingredients include aloe extract and birch bark extract, which both provide anti-inflammatory and anti-oxidant properties deep into the skin, while it provides sheer coverage. As many brands recommend, their product is most successful when paired with their 3 step skin care Clinique products. This minimally designed Aveda Inner Light Mineral Tinted Moisturizer is a real beauty. Not only is the packaging beautiful but so is the product itself. This tinted moisturizer comes with an SPF 15 protection, is oil-free, paraben free and cruelty-free. We absolutely love cruelty free beauty. The mineral tinted moisturizer is radiance infused giving your skin the pick me up it needs while protecting and evening out skin tone. The Inner Light Mineral Lotion finishes with a sheer covering, giving your face a bare natural look. This is perfect if you feel your skin needs a smooth out or a pickup, as it leaves you with a refreshed luxurious smooth finish. Not only is it great for skin texture but it offers protection against UVA/UVB rays which is a must for any facial product. Aveda is so confident with their product they have said it has been proven to increase radiance by 20% and increase moisture by 25%. It has also been said to be non-acne genic, which means it does result in breakouts. We just love it when brands have solid figures behind their claims. With so many great points this is worth a try for sure. It is great when used alone or if you want full coverage to match it up with the Inner Light Concealer. 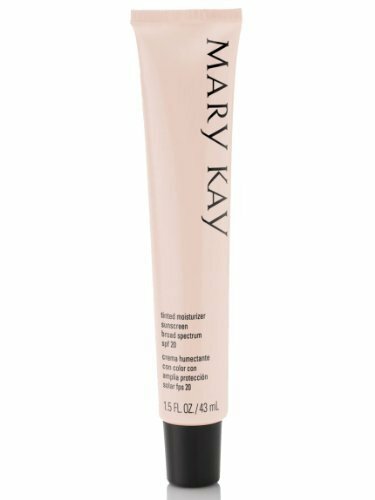 This Tinted Moisturizer Sunscreen from Mary Kay is a brilliant broad spectrum SPF 20 protector. It supplies your skin with three main benefits, giving you a sheer finish, with lightweight colors and an oil-free moisturizer. This product is also fragrance-free meaning there are no sneaky hidden harmful ingredients. This is a rare find and there are only a few of this particular product left on the market so grab it up quick if it suits your skin care needs. It is suitable for all skin types and has been clinically tested. This product can be used as a daily moisturizer for all-day wear lasting up to 10 hours. It leaves your skin with a sheer finish, for those days you want a casual, natural-looking face. The container is a small tube which is great to take with you in your bag for on-the-go applications. Some of the best ingredients in this product include the Camellia Extract which has terrific anti-oxidant properties keeping your skin protected from environmental pollution and other free radicals. It also contains soothing Aloe extract which works to keep your skin moisturized and hydrated throughout the day. The colors available for this product are best for a fair skin complexion. As mentioned before there are limited numbers left, so it’s worth giving a go. NARS offers us a sophisticated range of make-up and beauty products. The Pure Radiant Tinted Moisturizer provides intense advanced sun protection with a broad spectrum of protection with SPF 30. Having such a high SPF is great as there is no need to apply for further protection over and above your tinted moisturizer. This product is also oil-free ensuring it will work well on all skin types. Pure Radiant is fragrance-free, non-comedogenic and has been dermatologically tested. Coming in a larger tube than many tinted moisturizers it is great value for money. 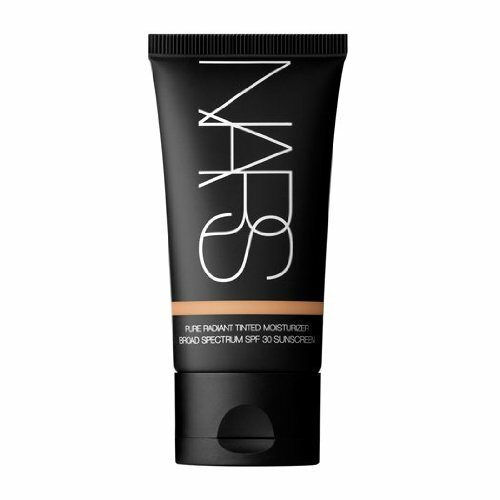 NARS tinted moisturizer provides you with a clear bare color film while making sure the skin is fully protected from the harmful rays of the sun. Not only does it cover and protect but this tinted moisturizer also corrects. If you suffer from hyperpigmentation or uneven skin tone, this tinted moisturizer will be great for you. NARS claims that you will see a reduction in hyperpigmentation and uneven skin tone in just four weeks of use. The botanical ingredients work to hydrate tired and dull skin leaving it refreshed from the first application. It contains a French Polynesian ingredient known as Kopara which revives the skins tone, hydrates and brightens your skins overall appearance. There you have it. The best tinted moisturizers for all skin types. Due to the fact that most of the above moisturizers are oil-free, they are great to be used on oily skin, to give you that desired sheer look. Another important factor of all of the above products is they all have sun protection, this is very important for our skin, but do know that you should have no less than an SPF 30mprotection on if you are spending time in sunlight. If you are using a tinted moisturizer with an SPF less than 30 then be sure to top up with another sun protection product. It is important to remember that all skin care success is a combination of diet, lifestyle, and products, so go ahead and change that cup of coffee for a cup of green tea and your skin will thank you.